Aberdeen could enter next season's Europa League second qualifying round after Feyenoord clinched the Dutch Eredivisie title. Manchester United's Europa League final opponents Ajax finished second, missing out on a Champions League group spot. United miss out as they will finish outside the Premier League top four. However, the winner of this season's final will go into next term's Champions League, which therefore opens up a Europa League qualifier spot. All three of Scotland's Europa League entrants were due to begin their campaigns on 29 June. Because this year's finalists cannot qualify for the Champions League group stage through their domestic leagues, Scotland will therefore move up one place to 24th in the Uefa rankings. This means that one of Scotland's entrants will have an extra two weeks to prepare before entering the competition on 13 July. Aberdeen are in pole position to seal that spot, with six points and a far superior goal difference separating them from third-placed Rangers in the Scottish Premiership, with two games remaining. 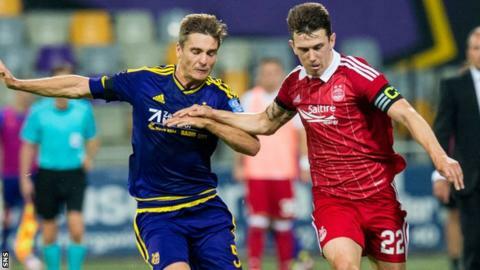 Aberdeen's recent performances in the Europa League, where they have reached the third qualifying round three years in a row, also mean they are likely to be seeded when the draw is made for both the first and second qualifying rounds on 19 June. Rangers and St Johnstone will also learn their Europa League opponents that day, while Celtic will find out who they will meet in the Champions League second qualifying round.